Today's world can be a difficult place to navigate from time to time, and it can take the strength that Jesus gives you to do so. It is important for children to understand the strength they can find with Jesus. At Children's Worship Bulletins, we make is easy for you to teach Sunday school lessons about strength with our fun and engaging bulletins. Doing the right thing or getting through trying times is easier when you have a relationship with Jesus. 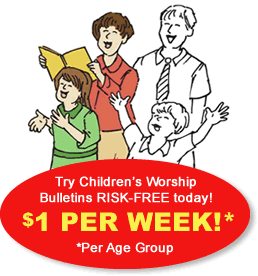 We help your children understand this lesson with Bible-based bulletins that are fun and relevant. All of our activities have been reviewed by our educational specialist to help determine that they are sound and appropriate for each age group. Our activities fall into two age groups, ages 3-6 and ages 7-12. Below is one of our Children's Worship Bulletins about the meaning of strength. By using our bulletins in a class setting, you can adapt them to a game or activity for the entire class. You can also use the bulletins as an introduction to your story or as a review exercise after the lesson. Either way it grabs the class's attention and focuses it on the activity at hand. Pass out activity sheets and pencils. Divide the students into teams of two or three. Give directions to the class, "Help the child find her way to Jesus by following the numbers. Work together to complete the puzzle. Raise your hands when you are done. The first team done wins a prize. GO!" When all of the students are finished, determine the winner by giving the correct answers. Reinforce the activity by opening up a discussion about strength. We use pictures, word pictures, mazes, puzzles and codes to teach your children about the power of strength. By making the activities fun and engaging, students enjoy learning and retain more of the information. All of our bulletins are based on Scripture, including the Old Testament, the four Gospels and the Epistles. You will find hundreds of bulletins to select from in our library. In fact, we have more bulletins than you will find anywhere else. Feel free to download as many as you need. In addition, all of the bulletins can be customized with your church name and date on them.